Alocasia princeps 'Purple Cloak' - Another Jewel for You to Try! 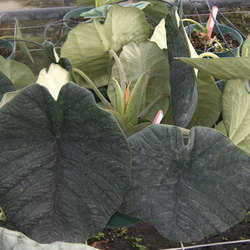 Several new Alocasias have appeared on the market in the recent year or so. One of them is Alocasia princeps, also known as 'Purple Cloak'. With my interest in this genus of plants, you can be sure I got my hands on one, and it is now blooming. Read on for more about this Jewel . . .
Spring is the time for renewal, for new growth, and flowers. So what could be more appropriate than a new Jewel Alocasia to grace your tropical collection? 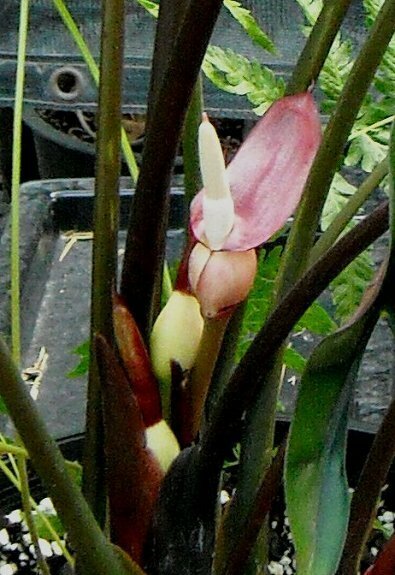 Alocasia princeps, or the Purple Cloak, used to be seen only in the greenhouses of dedicated aroid fanciers and collectors. However, as is true with many of the Jewels that are now more readily available, the Purple Cloak has been tissue cultured and now can be found and enjoyed by people other than just the well-heeled collectors. 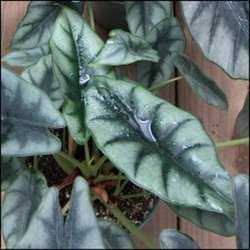 A. princeps produces leaves that are of heavier substance than those on the more common green Alocasia species grown as "elephant ears" in many gardens. The plant is reputed to grow as large as 4 feet tall or more, but I suspect that few casual growers are going to see one that large. Mine is not quite two feet tall overall and is already in bloom, but this does not mean the plant cannot grow larger. The issue here is that we are discussing a Jewel Alocasia, which means that a degree of finicky character is normal. The Purple Cloak is no exception to this, as a very well-draining potting mix and being ever watchful that you do not overwater the plant are two of the important factors to monitor. This plant seems to thrive under similar lighting conditions as the other Jewels I've covered here, meaning that it likes bright light but not direct sun. I would certainly advise keeping the plant out of a location where it might get caught in rain showers. I'm confident that overwatering will lead to a quick demise, based on the leathery texture of the leaves. 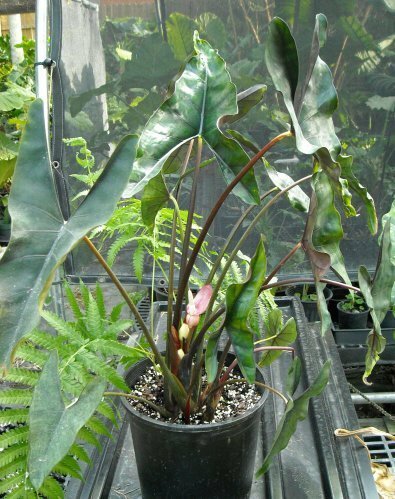 A. princeps prefers daytime temperatures in the low 80s F and nighttime temperatures from 65 to 70 degrees F. Cooler temperatures than this will slow or halt growth, first, then if too cold, the plant could go semi-dormant or perish. So that is another characteristic that places this one firmly in the ranks of the Jewel Alocasias. I'm thinking that one reason mine went into bloom at a tender young size is the cool winter temperatures it experienced for some days in January and February. Plants will often respond to stressful conditions by attempting to reproduce, so this thinking would be congruent with that observation. Whatever the reason, I'm happy to see the blooms because so many other specimens of Alocasia that I have are also blooming. This means I'll get the chance to mix this one up with some others, and I may even be able to come up with one nearly this pretty, but much hardier. Besides, the blooms are quite attractive in themselves (see photo at left), opening with a light red upper spathe that lightens further to a rich pink color. A. princeps has more to offer than blooms, as each leaf is distinctively V-shaped, with a dark green upper side and a deep purple-red underside (see photo below, right). This is what the common name is describing. The petioles also have a dark purplish-red color, so overall the plant has good color even without a bloom present. The coloration on both petioles and leaves is most intense on newly emerged leaves. 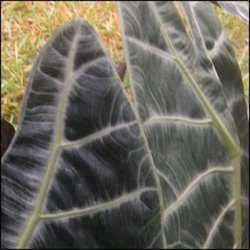 Like most Alocasia species with red or purple undersides to the leaves, the intensity of the color tends to fade as the leaves age. Nonetheless, I can easily imagine how stunning a 4 or 5 foot specimen of this plant would look, even while I lament the fact that I'm not likely to be able to grow one that large here in south Florida. A. princeps is widespread in Borneo and is found growing typically in rain forest on well-drained slopes and ridgetops. The plant is classified in the same group as A. reversa and A. venusta. This fact was evident to me the moment I was able to inspect the inflorescences at close hand. Except for the coloration, the overall bloom morphology is very similar to that of blooms found on A. reversa. Another member of the same group that A. princeps is a part of is A. ridleyi, a plant that seems to grow much larger and is also found in forms whose leaves have red to purple undersides. The leaves on that plant are thicker than those on A. princeps, and the blooms not nearly as colorful. That one is a Jewel I will have to discuss in a future article! The Jewel Alocasias - Spotlight on two little-known Jewels The Jewel Alocasias - Spotlight on Alocasia reversa Alocasia watsoniana - A Giant Jewel!